God of War: Chains of Olympus is a hack and slash, action-adventure game developed by Ready at Dawn exclusively for the Sony PlayStation Portable. The game is the third title of the God of War series and is a prequel set ten years before the original God of War. The game was released on March 4, 2008 in North America. This game is the second project developed for the PSP by Ready at Dawn, who was responsible for making Daxter, another handheld spin-off of a console series. Set ten years before the original God of War game, Chains of Olympus begins with the Gods sending Kratos to the city of Attica to help defend the city from the invading Persian army. Spotting a basilisk climbing over the city walls, Kratos gives chase through the city. While chasing the basilisk, Kratos confronts the Persian King inside the city and kills him. After defeating the basilisk he spots an object in the sky crashing towards Earth. Kratos fights through the city of Marathon and encounters a deadly fog that Morpheus has sent into the city. 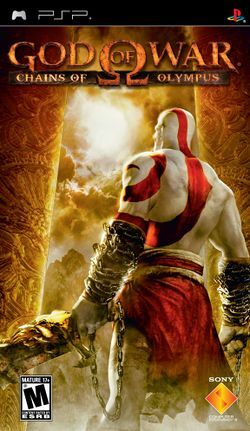 Eventually Kratos makes his way to the crash site and discovers the Sun Chariot and Temple of Helios. He encounters a statue of Athena who tells him that Helios has disappeared and Morpheus has used his absence to cause the Gods to fall "into a deep slumber." Athena wants Kratos to retrieve Helios so he can release Morpheus' grasp on the other Gods. Kratos fights his way through the Temple of Helios and down to the caves of Olympus, meeting up with Eos who tells Kratos that she will guarantee his release if he will help her save Helios from the Titan Atlas; Kratos does not believe her (having been lied to by the Gods before) however he reluctantly agrees to help save Helios. After restoring the fire steeds back to life, the horses lead Kratos into the underworld. He faces Charon on his boat in the river Styx. They fight before Charon knocks Kratos unconscious and throws him into Tartarus. After confirming that Atlas is missing from the underworld, Kratos eventually climbs out of Tartarus and defeats Charon. He takes the boat and follows the sunlight of Helios down the river Styx eventually coming upon the Temple of Persephone. He sees his daughter Calliope on the shorelines of the temple and gives chase only to lose track of Calliope. Instead he meets Persephone, Queen of the Underworld. Persephone tells Kratos that Calliope is in the fields of Elysium and that the only way to see her again is for Kratos to "release" all of his evils and become mortal, giving up his powers given to him by the Gods. After transferring his power into a tree, Persephone reveals to Kratos her true plans. Bitter at being betrayed by Zeus and being tricked by Hades, Persephone was the one who had freed Atlas. While Kratos was disarming himself Atlas was slowly carrying out her plan to destroy the pillar that held the world and Olympus atop of the underworld. Persephone plans to kill everyone, including herself, to free her from her situation. Kratos realizes now that if he stays with his daughter it would mean the end of the world for everyone including Calliope and himself. He eventually sacrifices seeing his daughter again in order to regain his power. Kratos has a final battle against Persephone atop the pillar. After chaining Atlas to the pillar, Kratos is able to defeat Persephone and prevent her plans from coming to fruition. He returns Helios to the sky but weak from battle, falls from the sky and crashes on a bluff overlooking the Aegean Sea. Two gods talk over Kratos's unconscious body before taking the Gauntlet of Zeus and Sun Shield from him. This page was last edited on 2 February 2011, at 17:15.